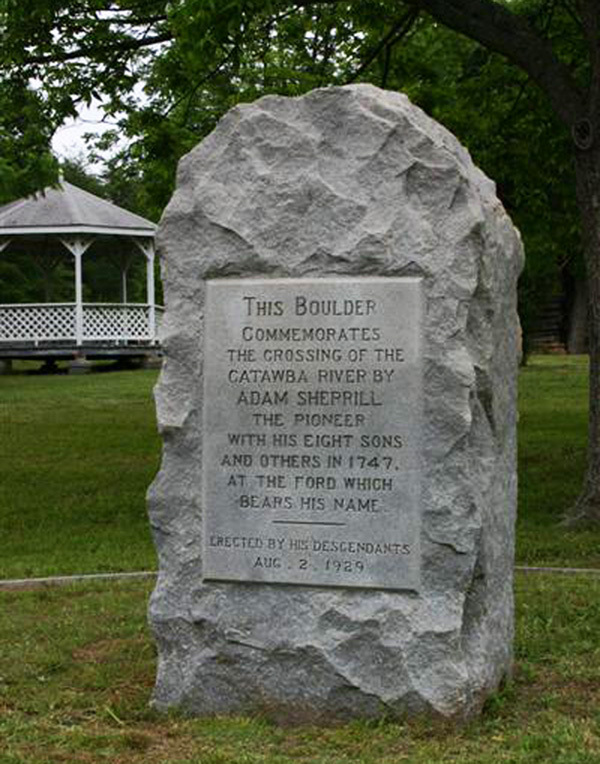 The monument to Adam Sherrill and his sons is an arched top granite tablestone with a rusticated finish except for a finished area on the front with the incised inscription. It stands six-feet tall, is three-feet wide and reported to weigh five tons. 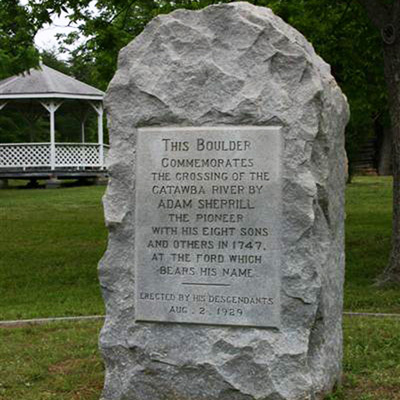 THIS BOULDER / COMMEMORATES / THE CROSSING OF THE / CATAWABA RIVER BY / ADAM SHERRILL / THE PIONEER / WITH HIS EIGHT SONS / AND OTHERS IN 1747, / AT THE FORD / WHICH BEARS HIS NAME. Over 500 members of the Sherrill clan were in attendance for services at the local school auditorium. The Rev. W.L. Sherrill of Charlotte presided and Kemp P. Nixon of Lincolnton delivered the primary address. At noon, the services adjourned to reconvene at the marker location where a child, James Sherrill, pulled the cords to reveal the memorial. A picnic dinner was served afterwards. Adam Sherrill brought his family by wagon down from Virginia into the Catawba Valley in 1747. They are thought to be the first white settlers to cross the Catawba River and live in what is now Catawba County. They forded at a spot where three islands made the dangerous passage easier, reportedly after Sherrill saw buffalo crossing there. This spot came to be called Sherrill’s Ford. Among Sherrill’s party was a slave named Vaul who would also have been the first black to settle in the county. The memorial marker stands on a front lawn, with several mature trees behind it. The marker was originally located at Sherrils Ford on the Catawba River. This site is now covered by Lake Norman which was created in 1962.